Having said that this site is about those roads which aren't likely to be a strategic route, the road covered on this page is the exception that proves the rule. The road from Brecon to Hirwaun is made up of two separate road numbers - the northernmost section is the A470 and the southernmost section is the A4059. In Wales, they don't come much more strategic than the main road from South to North Wales. In spite of this strategic importance, I feel justified in including this road on this site as it runs through the heart of the Brecon Beacons National Park, over a wild and remote landscape. 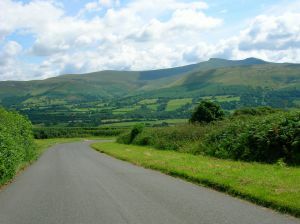 The drive begins at a roundabout on the A40, to the south of the Brecon bypass, itself a road offering good views of the mountains, although it doesn't really get into the heart of the mountains. I feel I should also point out that I have driven through here in driving rain and the cloud cover has been such that there isn't a mountain in sight. On the other hand, if you pick a nice sunny day, such as the day I had last summer (2004 for my first visit and also 2005 for my second visit), the route through the mountains is a lovely drive with good views - and all this from a trunk road! 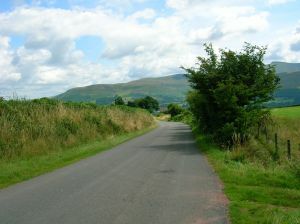 The climb from Brecon is not too steep, but long - over 6 miles we climb a total of 1000 feet, with the roundabout on the A40 having an altitude of around 140m. The river below is the Afon Tarell, which flows north from here in search of a path to the sea. At Libanus, we can turn off the A470 towards the National Park Visitor Centre. We made the journey in order to find a place for a picnic, so we didn't actually see the visitor centre, but we did take the following photographs. 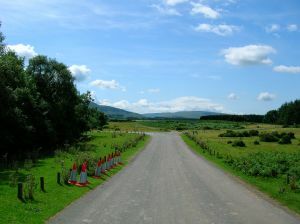 The first is a view looking south on the Visitors' Centre access road. The second is taken on the slightly more important (but still very minor) road that runs across the end of the road in the first picture. Again we are looking south(ish). 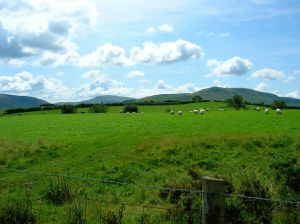 The third is taken on the minor road heading back towards the A470, and shows the mountains rising in the distance. The fourth is taken from the same location, but looking along the line of the road. 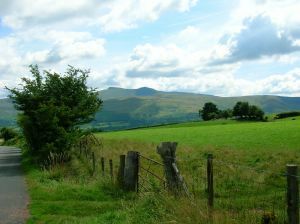 The final picture on this minor road is taken a little nearer to the A470 again, giving an uninterupted view across to the mountains. The peaks visible in the picture don't look that high, but I think the highest point visible is Pen-y-fan, the highest point in South Wales, at 886m, or 2907 ft.
Go to the next page to see pictures of the A470.